Graphic designer, Marco Manansala, of Marco John Design has recently released his take on what a beer bottle should look like. The packaging is inspired by the atomic bomb from the 1940’s while the name explores the subject of illegal weapons trade. 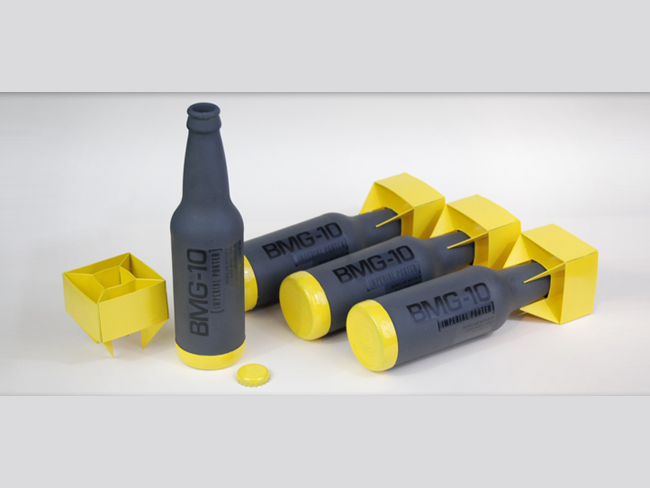 Dubbed as the BMG-10, each bottle took approximately 10 hours to create. Materials such as top-shelf alloys, primer, and engine enamel were used to create this fictional product. A wooden crate with a bracing system was also constructed to hold the bottles in place during transportation. Check out the pictures below!